For obvious reasons, the Eustis Street Fire House is very special to Historic Boston. 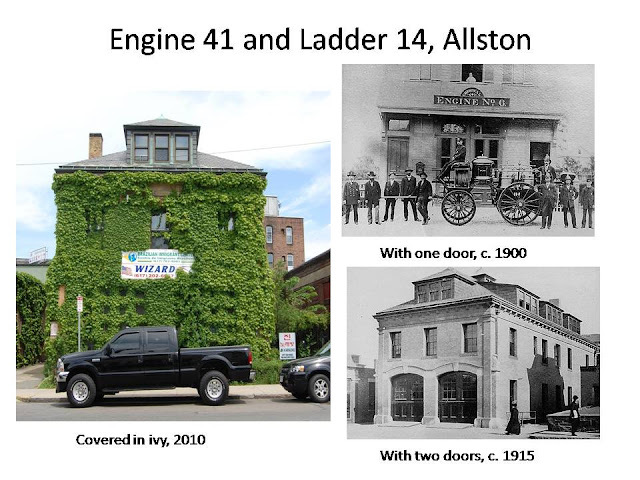 As the oldest extant fire house in the city of Boston and one of the few that was built to house human powered fire equipment, it is significant historically. It is the oldest remaining building in Roxbury's Dudley Square and together with the adjacent Eliot Burying Ground and nearby 1870 Owen Nawn Factory, form a historic district that anchors the northern section of the business district. With all it’s well-preserved architectural detail, we think it’s one of the most distinctive (and attractive!) buildings in the city. So, we began to wonder about the fate of other historic fire houses in Boston and discovered many that have taken on new uses over the years. Clearly Boston is as dedicated to re-using its old fire houses as it was to building them. Once you start looking, for these fire houses, you realize that they are EVERYWHERE! 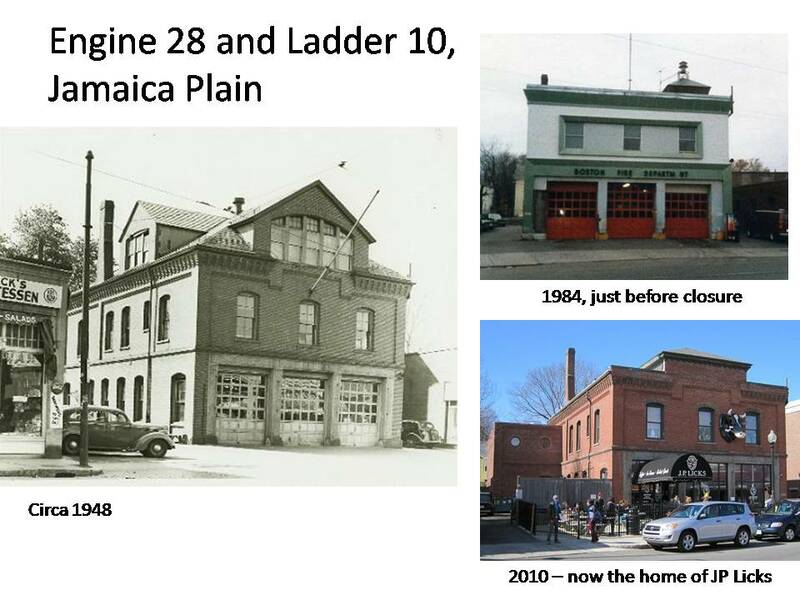 We have profiled a few of these re-used fire houses below. Take a look and soon you too will be spotting fire houses everywhere you look! The village of Allston began to experience considerable growth in the 1870s and soon needed the necessary municipal infrastructure, such as a post office and a fire house. The first fire house, constructed of wood, was built in 1876. It was replaced by this more substantial yellow brick fire house in 1890, and was occupied by Chemical Engine Company 6. In 1914, the building’s front façade was altered when the fire department added a second apparatus door. On April 5, 1916, Ladder Company 14 was reorganized at this firehouse. 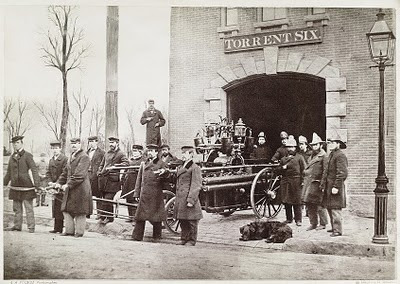 Ladder 14 had been in service at Fort Hill Square, Downtown from January 30, 1893 to April 23, 1915. Engine 41 and Ladder 14 remained at this firehouse until June 15, 1977 when the companies moved to a new firehouse at 460 Cambridge Street in the Union Square section of Allston. The firehouse at 16 Harvard Avenue was closed on that date. The building was sold and converted into office space and retail uses on the first floor. Built in 1872 as part of the Town of West Roxbury Fire Department, this fire house has a commanding presence of this section of Centre Street in Jamaica Plain. Just two years later, West Roxbury became part of the City of Boston, and Engine 1 and Ladder 1 immediately became Engine Company 28 and Ladder Company 10. The two companies remained at the current site until 1984, when a new fire house was built just a few blocks away. By that time, the building had undergone so many exterior changes, it was hardly recognizable as the handsome three story brick fire house constructed in 1872. At that time the building was purchased and the transformation back to its original appearance began. While the third floor was never rebuilt, the building today looks very much like it did when it was first constructed. Today, the well-loved J.P Licks Ice Cream Parlor occupies the first floor, uniquely adorning the fire house’s front facade with a large cow head. Built in 1924, this fire house replaced a fire house that had been built in 1865. Engine 40 called this building home from 1924 until it was closed on May 13, 1977. At that time, Engine 40 moved to a new firehouse, diagonally across the street at 239 Sumner Street. After the fire department moved to its new building, the fire house was used by the city's Department of Public Works as a remote office until the early 2000's. The building was for sale for several years as the city tried to find the right use for the building. In 2004, Boston's Department of Neighborhood Development developed guidelines of the redevelopment of the property. In May of 2005, Zumix was awarded ownership of the building. Zumix, founded in 1991, is a community-based program for the development of music and performance arts in the East Boston neighborhood. For more information about the recently completed project at this fire house, check out the Zumix project page. The great Boston Fire of 1872 was a disaster that took two days to control and has gone down in history as the city’s worst fire, destroying 776 buildings and spreading over 65 acres of land. The causes of the fire and the resulting destruction were plentiful, and the city took great effort to make changes to prevent it from happening again. 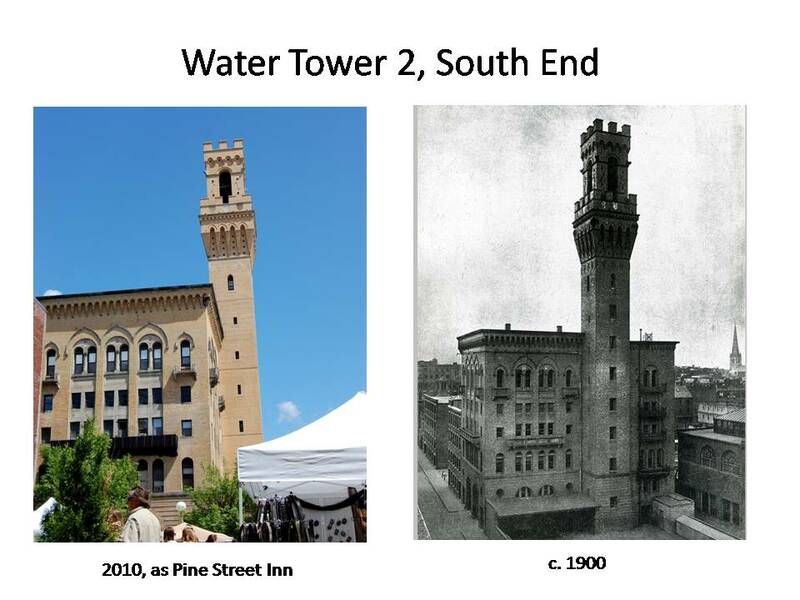 One such change was the addition of the tall water and observation tower in the South End, where the tall and well located vantage point would allow the fire department to pinpoint problems quickly. The tower, modeled after the Palazzo Vecchio in Florence, Italy, and the Pilgrim Monument in Provincetown, was completed in December 18, 1893. The firehouse was part of a larger building complex that officially became Fire Department Headquarters on July 1, 1895. The tower was also used to train recruits who needed to learn how to scale tall buildings to fight back fires. In the 1950s, the Boston Fire Department moved to 115 Southampton Street in Roxbury, about a mile away. In the 1970s, the building became home to Pine Street Inn, a non-profit organization that runs a homeless shelter in the space. In recent years, Pine Street Inn has taken on large maintenance and renovation work at the tower, which kept the tower under scaffolding for years. Now free from its covering, the newly rehabilitated tower is a welcome sight along Boston’s skyline. For more information about fire houses around the city, please visit the website of the Boston Fire History Society. 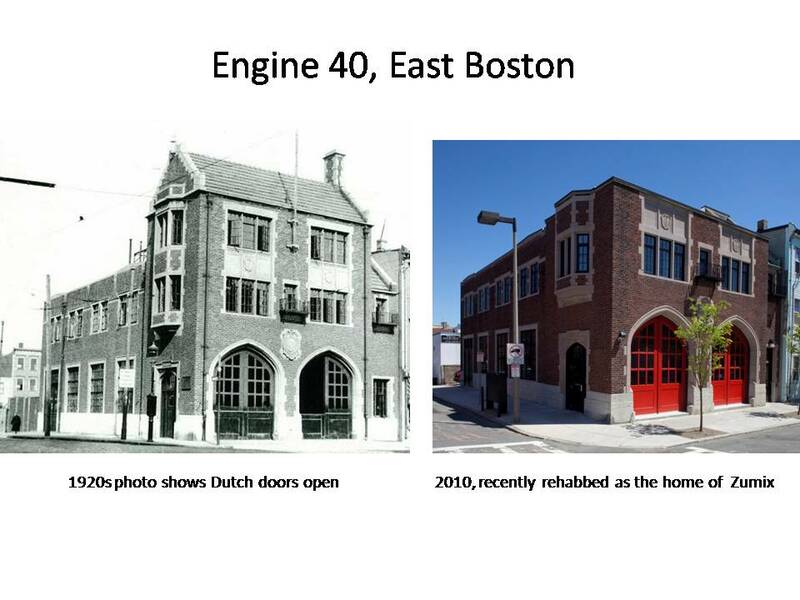 Do you have a favorite re-used fire house in Boston? Let us know about it in the comments section below, or leave us a note on our facebook page!